Desjarlais shows us not anonymous faces of the homeless but real people. While it is estimated that 25 percent or more of America's homeless are mentally ill, their lives are largely unknown to us. What must life be like for those who, in addition to living on the street, hear voices, suffer paranoid delusions, or have trouble thinking clearly or talking to others. Robert Desjarlais works against the grain of media representations of homelessness by showing us not anonymous stereotypes but individuals. He draws on conversations as well as observations, talking with and listening to shelter residents to understand how they relate to their environment, to one another, and to those entrusted with their care. His book considers their lives in terms of a complex range of forces and helps us comprehend the linkages between culture, illness, personhood, and political agency on the margins of contemporary American society. 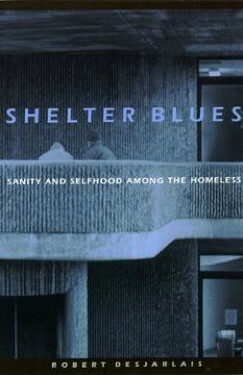 Shelter Blues is unlike anything else ever written about homelessness. It challenges social scientists and mental health professionals to rethink their approaches to human subjectivity and helps us all to better understand one of the most pressing problems of our time.